Vinyl flooring is one of the most versatile flooring options, making it one of the fastest growing categories in the industry. Low cost, this durable material is perfectly suitable for many residential and commercial spaces. 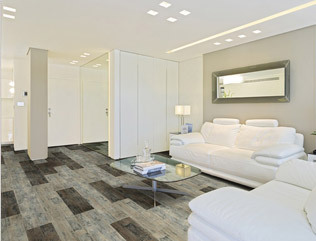 When it comes to vinyl flooring products, FlooringInc.com offers a variety of sizes, styles, and installation types. Many gorgeous and high quality images mimic the look of stone and wood at price points that can fit into any budget. 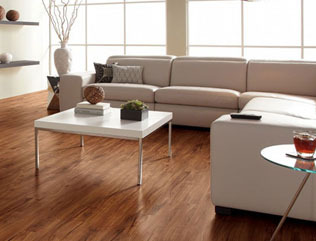 Unlike expensive hardwood flooring, vinyl can be installed anywhere and is super easy to clean and maintain. Spills can easily be cleaned up with the swipe of a dust mop. 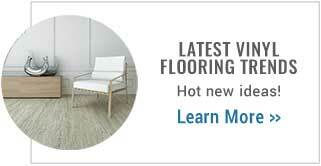 Below, we will help you understand a little more about vinyl flooring and (hopefully!) help you to make the right choice for your space. 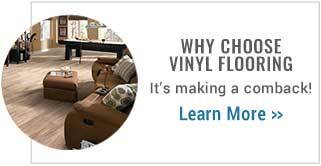 Did we mention vinyl is easier to clean than linoleum flooring? Install over most existing hard surfaces. Real hardwood looks & sizes. Never has to be resurfaced like wood. Never needs to be sealed like stone. Great for covering larger spaces. 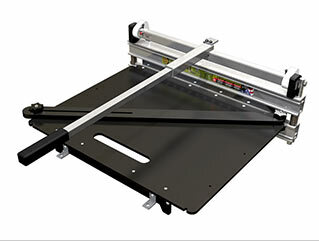 Lower cost per sqft for large, wide rolls. Vinyl is a great, inexpensive option that many people forget about, or they have no idea that it can look just as beautiful as tile! Today we’re talking all about vinyl, and why it’s such a great flooring option. If you like the look of tile but not the price tag, consider going vinyl. 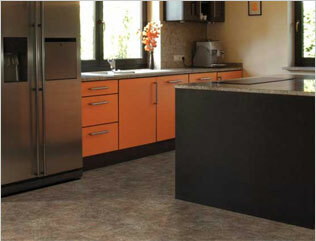 Vinyl flooring is an incredibly cost efficient and versatile option. It’s easy to clean and install (peel and stick for the win!). Because it’s synthetically made, practically any color or pattern can be created, so it’s great for enhancing a space with texture or color. Think you want to go bold? Or maybe something subtle? Yeah, vinyl can do that. Vinyl also has a few practical benefits too. It has some “give,” making it a bit softer on the feet than porcelain or ceramic tile. It’s great for showrooms, workspaces or anywhere you’ll be on your feet for awhile. Vinyl is also super durable since it’s designed with a “wear layer” to minimize the effects of tread. Just don’t use it in a wet environment, like a shower or exterior floor. A little moisture won’t hurt, though: vinyl has a protective antimicrobial layer designed to resist mold and mildew. Vinyl comes in three different options: tiles, planks, and rolls. While vinyl tiles can definitely deliver that vintage checkerboard look, your design options don’t stop there. 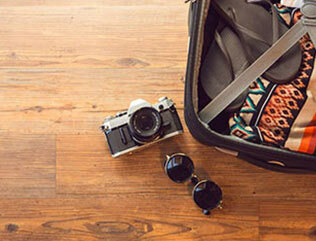 Stone, aluminum, resort-style, tread – there’s virtually no look vinyl tiles can’t replicate. Tiles are easier to replace too. 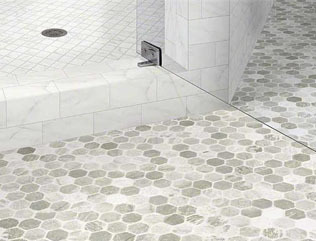 If a tile becomes damaged, it can be removed and a new one installed without worrying about pulling the whole floor up. 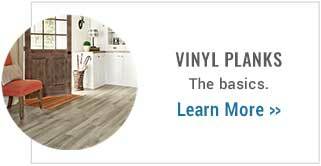 Vinyl Planks offer the same easy-install and repair benefits as vinyl tiles, but they give the feel of hardwood flooring. With the help of modern design technology, vinyl planking can be patterned and embossed to mimic a wide array of hardwood styles. Rustic or rich, weathered or wine-stained, vinyl planks are a discount shopper’s alternative to the charm of hardwood flooring. 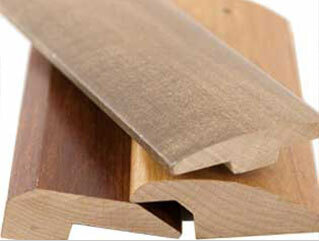 Vinyl rolls, also called “sheets,” give you the same look as tiles or planks, but at an even deeper discount. Manufactures save money by producing these uncut sheets of vinyl, and you reap the savings benefits. Vinyl rolls are also great against moisture because there are no seams where water can hide. The trick with rolls is that they have to be cut to fit the space, and you can’t customize the design like you can with tile. Rubber-based rolls don’t offer as deep a discount, but they are oh-so-great for dance floors or basements—anywhere you want the smooth look of hardwood and the absorbency of rubber. Waterproof flooring is just that, 100% waterproof! Featuring attractive visuals and low maintenance cleaning, it is a quickly growing fan favorite. 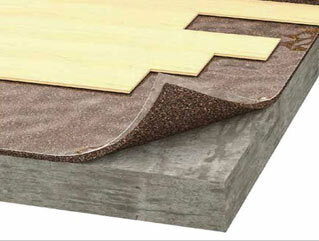 Waterproof / WPC flooring is the step up in the vinyl flooring world, offering the best of the best in quality and look.